Desert ‘magick’ and astral bodies – what could they have to do with Special Collections? Our current exhibition, exploring the experiences and attitudes of the British in India from the early 17th century to the turn of the 20th, features a selection of material from the Union Club Library, purchased by the University in 1964, about which I wrote previously. But it also draws on the collection of Victor Neuburg. Delving into how we come to have Neuburg’s books uncovers a cast of impossibly colourful characters, so much so that it’s hard to know where to begin. 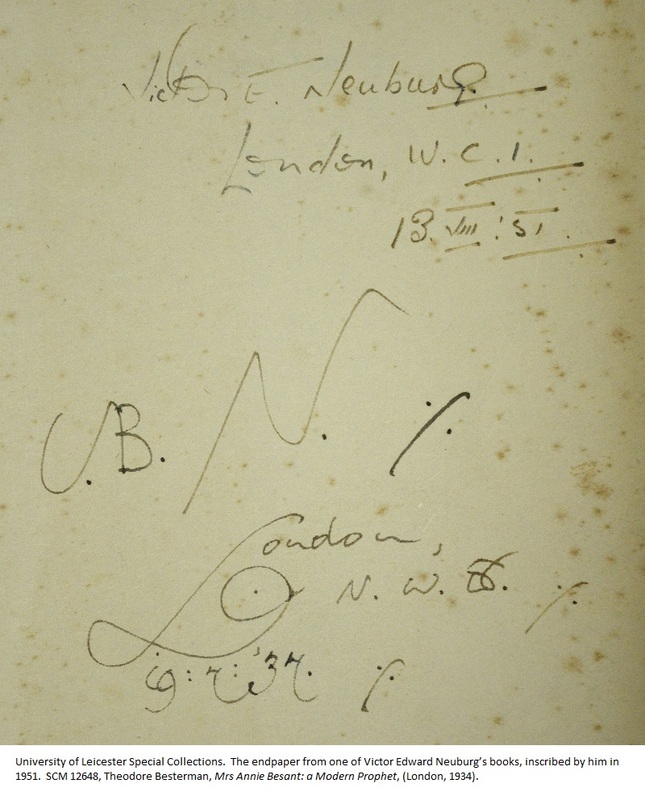 The endpaper from one of Victor Edward Neuburg’s books, inscribed by him in 1951. SCM 12648, Theodore Besterman, Mrs Annie Besant: a Modern Prophet, (London, 1934). Victor Edward Neuburg (1924-96), from whose collection the books come, was a writer and Senior Lecturer in Librarianship at the Polytechnic of North London. He was awarded a M.Ed. from Leicester in 19681 – this may be why his collection came to us, although I have, so far, not been able to find any information about the circumstances of its acquisition. His father, Victor Benjamin Neuburg (1883-1940) was anything but a librarian! The elder Neuburg, a poet and writer on theosophy and occultism, was an intimate of Aleister Crowley. Crowley, an alumnus of Trinity College Cambridge, approached Neuburg during his time as an undergraduate there. ‘He was an agnostic, a vegetarian, a mystic, a Tolstoyan, and several other things all at once,’ Crowley wrote of their first meeting. ‘He endeavoured to express his spiritual state by … refusing to wear a hat … to wash, and to wear trousers. Whenever addressed, he wriggled convulsively, and his lips, which were three times too large for him … emitted the most extraordinary laugh … to these advantages, he united those of being extraordinarily well read, overflowing with exquisitely subtle humour, and being one of the best natured people that ever trod this planet. But from the first moment I saw him, I saw far more than this; I read an altogether extraordinary capacity for Magick’2. Neuburg became Crowley’s chief disciple (no doubt his large private income came in handy too) and accompanied him on a notorious expedition to the Algerian desert to perform extreme ‘magick’. There’s no space here for a detailed discussion of that expedition, but the flavour of it can perhaps be gauged by the fact that Neuburg had his head shaved, except for two horn-shaped tufts, and allowed Crowley to lead him by a chain attached to a metal collar round his neck. This, to enhance Crowley’s impact on the Bedouin as a great Magician, who had ‘mastered so fantastic and fearful a genie’3. SCM 12640, Annie Besant, Annie Besant: an Autobiography, (London, 1908). 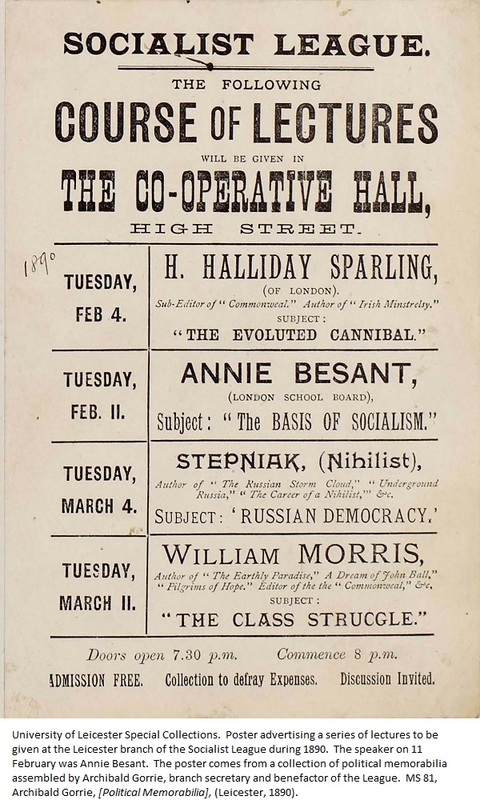 Poster advertising a series of lectures to be given at the Leicester branch of the Socialist League during 1890. The speaker on 11 February was Annie Besant. The poster comes from a collection of political memorabilia assembled by Archibald Gorrie, branch secretary and benefactor of the League. MS 81, Archibald Gorrie, [Political Memorabilia], (Leicester, 1890). Library. The contents of the Neuburg Collection reflect Victor’s lifelong interest in the history of secularism and radical freethinking. Which brings us smoothly on to another larger-than-life personality, Annie Besant, subject and author of a number of the books. 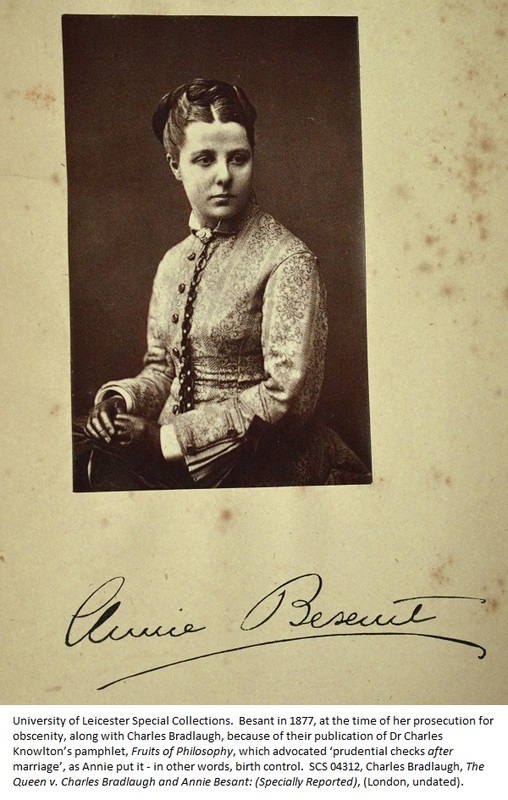 Besant in 1877, at the time of her prosecution for obscenity, along with Charles Bradlaugh, because of their publication of Dr Charles Knowlton’s pamphlet, Fruits of Philosophy, which advocated ‘prudential checks after marriage’, as Annie put it – in other words, birth control. SCS 04312, Charles Bradlaugh, The Queen v. Charles Bradlaugh and Annie Besant: (Specially Reported), (London, undated). Annie Besant in 1885, at the age of 38. 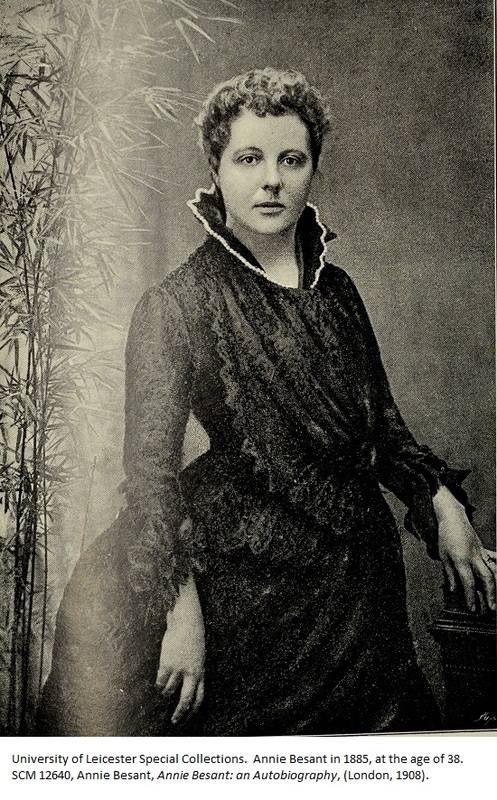 SCM 12640, Annie Besant, Annie Besant: an Autobiography, (London, 1908). would, in all likelihood, have married. 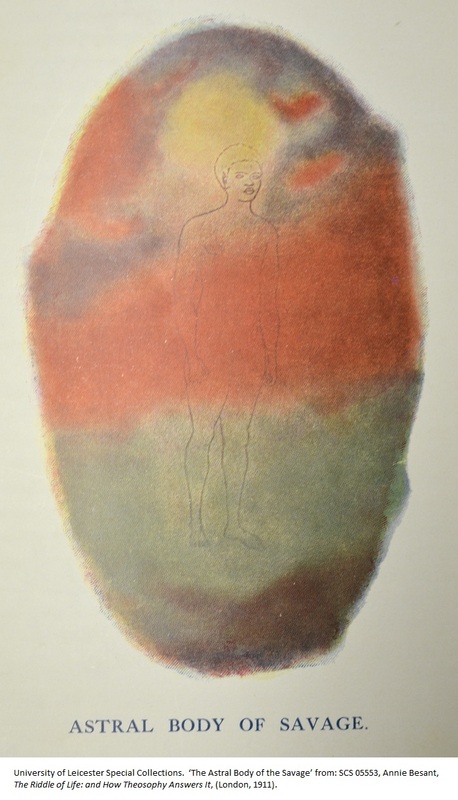 ‘The Astral Body of the Savage’ from: SCS 05553, Annie Besant, The Riddle of Life: and How Theosophy Answers It, (London, 1911). 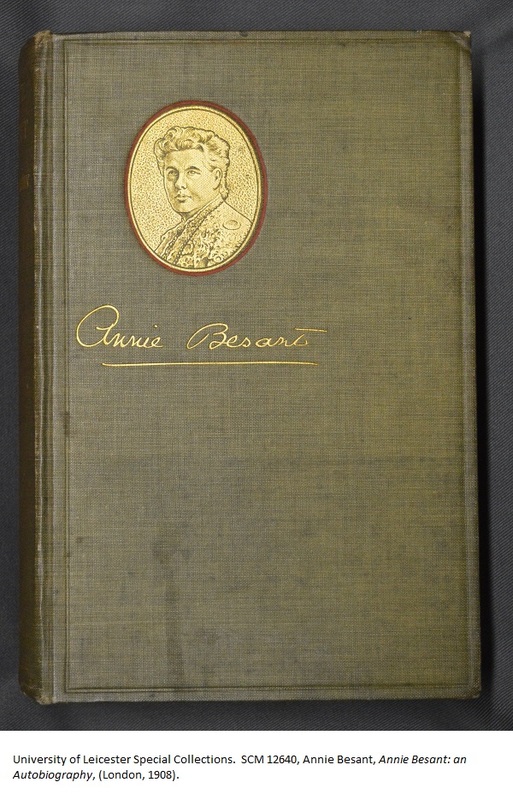 Reading Besant’s autobiography (which sadly only covers the first 44 years of her life, up to her conversion to Theosophy), you can’t help but feel that she would have been difficult to live with, but neither can you help being charmed by her candour and, above all, her sheer ‘heart’. And, in spite of the extraordinary journey (literal, as well as political and spiritual) of her life, it still seems that ‘you can’t take the girl out of the woman’. She describes how, in February 1875, she was trapped in a train compartment with a drunken man, on his way home from the greyhound racing. (At that time, there was no connecting corridor on trains, so you couldn’t move from the compartment between stations.) ‘Never before nor since have I felt so thoroughly frightened11’, she writes, an astounding comment, considering all the amazing things she went on to do – but a revealing one. Besant died in India in September 1933, having been leader of the Theosophical Society for 25 years. A portion of her ashes was buried in the Garden of Remembrance at Adyar, the remainder was sprinkled in the Ganges at Varanasi. The exhibition runs until 30 September 2016 in the basement of the David Wilson Library. Entry to the library is free but controlled, so if you are not a student or member of University staff, please ask to be let through the barrier. Details of staffed opening hours are available on the library website. 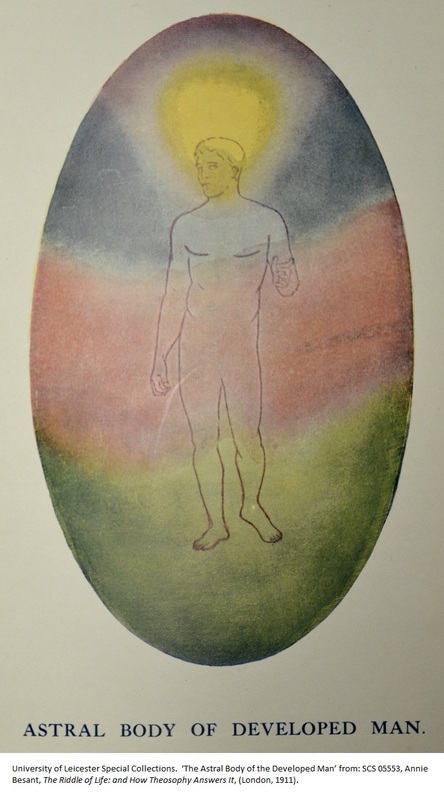 ‘The Astral Body of the Developed Man’ from: SCS 05553, Annie Besant, The Riddle of Life: and How Theosophy Answers It, (London, 1911). Thank you very much for this helpful information, Chris. I’ll certainly see whether I can trace Caroline Robertson. It would be good to find out more about how the books came to us.